Aggarwal, D, Dadush, D.N, Regev, O, & Stephens-Davidowitz, N. (2014). 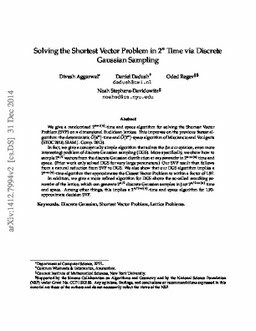 Solving the Shortest Vector Problem in 2^n Time via Discrete Gaussian Sampling. arXiv.org e-Print archive. Cornell University Library .